It seems like every time I set a goal and dedicate myself to sticking to it, Life stomps in and chucks my plans out the window. Every time it happens, I find myself thinking, “Come on, now, how could you expect Life to be any other way? You always knew he was a jerk.” We all know the world is complicated and messy. Our clichés illustrate this point quite poignantly. The question, I suppose, isn’t whether or not we’ll hit roadblocks. It’s how we overcome them. Apparently I’m not very good at that last part. Example: I’m woefully behind on writing. I should be way further along in my next book, and every time I think about it, I start experiencing this strange pain in the back of my left eye socket, and an urge to climb into bed and sleep for the next week or so. But if I don’t do the work, nothing will get done, so before the sun comes up, I chain myself to my desk and stare at the blank page willing words to flow. After I get a few words in, I say, “Hah! This isn’t so bad,” and set my goal at 1,500 words. 500 words in, I get a call from a family member who needs to move out of their current house. Immediately. And they need help or else it won’t happen in time. I then spend the rest of the day, until 9pm, helping them move, and come home so exhausted all I can do is climb into bed. Then the next day comes and I’m so depressed I didn’t write the day before that I don’t write that day either. Ugh. It’s silly. Actually, it’s ridiculous. I know that. But how do you change it? As with most things in life, I think the key is grace. Everyone messes up. Life throws you curveballs you sometimes have to catch with your face instead of your glove. Doesn’t mean you’re a worthless player, or that you should walk off the field and give up. Just means you’ll probably have a welt the size of Nebraska, and yep, people are probably going to laugh at you. That’s fine. People laughed at Jesus, too. There’s successful humility in graceful failure. Taking hits, falling down, struggling and not quite getting to the base on time, it’s all a part of the game. It means you’re IN IT. You’re playing. You’re alive. And that’s all that’s asked of us. We can’t win the game. Only God can do that. He’s the star batter, and we’re just there to run the bases as best as we can (and only after he’s hit it out of the park). Yeah, I’m writing to myself today. But I don’t write because I’m so confident I have this nugget of wisdom to offer to any soul lucky enough to grace my side of cyberspace. I write to understand the world and myself. If it helps other people, great, but if I really understood much of anything, I don’t think I’d write anywhere near as much. It’s my stupid that keeps me trying to get smart. And honestly, I think that’s how life works. I pray because I need guidance. Because I need God to live through me before I can do anything worthwhile. Because if God doesn’t work through me, I’m just laboring in vain. This kind of thinking is different from fatalism. It’s not that we should expect ourselves to fail. It’s that we shouldn’t be surprised or let it drag us down. That instead, we should let it urge us to lean more on God, to rely on him for everything. 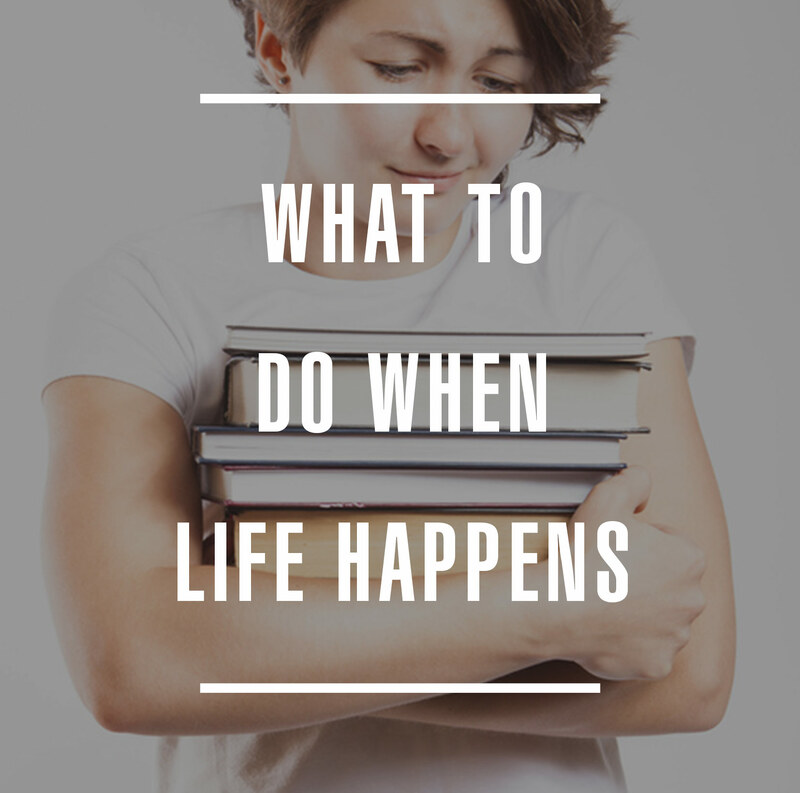 So what should we do when “life happens”? Steady ourselves on God’s shoulder, and move on. So, now that I’ve written 686 words, excuse me while I find new ways to avoid working on my book. Wish me luck!